After 15 years as a professional cyclist, Fabian Cancellara has officially hung up his wheels. I have tried to write my farewell post to him for about two months now but nothing gelled. But I finally hit on the way of saying goodbye to him – by talking about all the reasons he’s made me love cycling and why, even though he won’t be in the peloton, I will continue to love cycling. I didn’t mean to get interested in cycling. A friend of mine had asked me to record the opening weekend of 2004 Tour de France for him (he was off to do an Ironman…). In those ancient days, you could only record something if it stayed on the right channel the whole time, so I watched it while it was recording. Of course, that was the first yellow jersey that Cancellara pulled on – he won the opening prologue in Liege and he prompted burst into tears. That sealed it for me – you know how much I love athletes who cry with joy! Watching sport has always been a thing with me. I watched football (American), baseball and ice hockey with my dad when I was growing up (I can still explain the infield fly rule to anyone willing to listen) and I’ve found that the easiest (and best) way to get under the skin of a sport was to watch one particular person. It keeps you interested as you get familiar with the sport and learn the rules. Starting out by watching Fabs in the Tour meant I paid attention to *everything* and really started to learn the different roles within the peloton. Of course, I always loved seeing him in yellow. As he holds the record for most days in yellow without winning a Tour with 29, I got to see that a lot! I have a theory about tennis that actually works in this context. The theory is that great rivalries of McEnroe v Borg, Navratilova v Evert, Nadal v Federer made those athletes the legends they are. They would have been successful without that other person, but by continually being stretched by their rival, they raised their games so much that they also raised the standard of the sport as a whole. 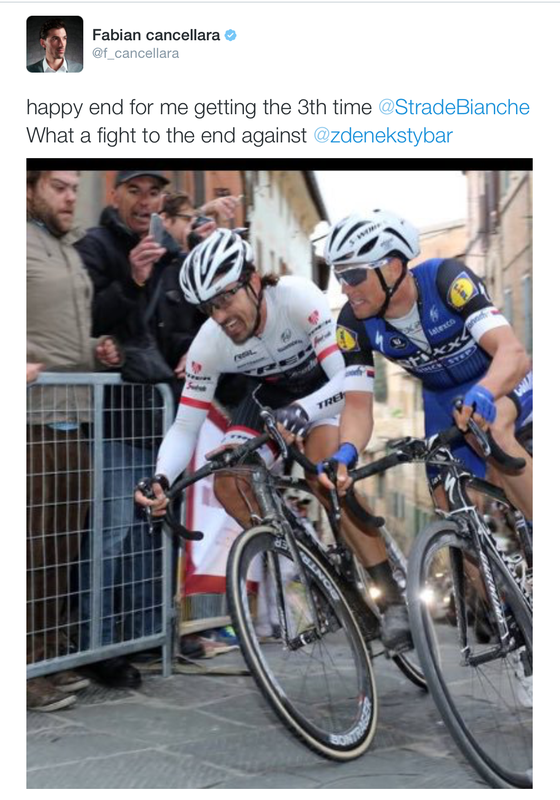 And that’s what I believe about Cancellara and Boonen in the Classics. The two greatest Classics riders of their generation duking it out on the Muur or on the cobbles of northern France made each rider work that much harder. We have been so lucky to see them both in full flow. Fabs retires with the joint record of time trial world championships with four – Tony Martin just tied that record this year. But a record that Martin can’t beat is a podium record – Cancellara has been on the podium of all seven time trial world championships he’s ridden – four gold (2006, 2007, 2009, 2010), three bronze (2005, 2011, 2013). I wouldn’t say that watching time trials is the most exciting part of the sport for me, but when Fabs was riding, he had me on the edge of my seat. Cancellara’s palmares might be stuffed to the gills with accomplishments – from Monuments to maillots jaune – but it’s not his wins that I love so much, it’s the way he rode day in, day out. He’s the kind of rider that I love most – one who rides hard, takes the sport seriously but not necessarily himself, who rides balls-to-the-wall and has been willing to risk losing in order to win. His performance in Strade Bianche this year is the perfect example. He rode hard, took on the chase of Brambilla single-handledly, took the inside corner away from Stybar and powered his way to victory. So thank you, Fabs, for giving me such a love for cycling. Spring won’t be the same without you – but I can’t wait for it to start. This is a perfect farewell, and it also speaks to how I began to enjoy the sport of cycling. I hope Fabs actually has a chance to read this. I know he would enjoy it. Thanks, Sharon. I wanted to do him justice! He was definitely a great one. Also, I liked your portrayal/explanation. I choose my sporting heroes in much the same way–follow the one whose “play” you admire. They don’t have to be the flashiest, but they have to put it all out there. Thanks, Anthony. It’s the perfect way to get into a sport!